Last week, Justice League director Zack Snyder shared a new video to the social media site Vero, which offered our first look at Jason Momoa swimming underwater as Aquaman. While the scene was quite brief, it was still intriguing nonetheless, showing Arthur Curry swimming up to a statue that featured what looked like the armor we have already seen Aquaman wearing in promotional photos. 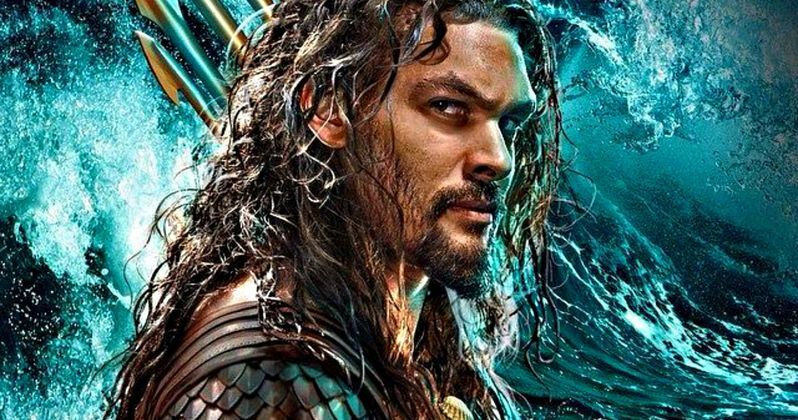 Some fans began to question whether or not that was actually Jason Momoa in that shot, or just a CGI rendering of the actor swimming under water, but Zack Snyder sent out a new photo to prove those fans wrong. Zack Snyder took to the new social media app Vero to reassure fans that it was actually Jason Momoa in this shot, which was captured by Twitter users, along with a side-by-side shot from the actual video. Instead of Jason Momoa being a CGI rendering, it turned out to be the opposite, with the actor being positioned on a rig controlled by a crew member wearing an all-green suit, surrounded by green screens, with his entire underwater environment being created digitally. Here's what the director had to say on the social media app. "People are wondering whether he was CG or not. He's not. Hair and environment CG otherwise all Jason." While very little is known about this scene, there has been plenty of speculation since it was released last week. It's possible that this scene could be a continuation of one scene that was shown in Comic-Con footage, where Arthur Curry was seen standing on a pier, drinking a bottle of alcohol, before he was consumed by water. Since Aquaman is seen in this brief video wearing similar pants from that scene, this brief scene could come shortly after the pier scene, but we have no way of telling for sure. It also isn't known how much we'll see of this underwater environment, or if director James Wan will be using the same harness and green scene techniques for the stand alone Aquaman movie. Since Aquaman is just one part of this massive superhero team, it doesn't seem likely that we'll spend too much time underwater, or even if we'll get to see the mythical kingdom of Atlantis too much in Justice League. We do know that Amber Heard's Queen Mera and Willem Dafoe's Nuidis Vulko will also be introduced in Justice Leauge, before returning in the stand alone Aquaman movie. Hopefully we'll get to see more of this underwater scene when the next Justice League trailer debuts, but it still isn't clear when that will be released quite yet. Fueled by his restored faith in humanity and inspired by Superman's selfless act, Bruce Wayne enlists the help of his newfound ally, Diana Prince, to face an even greater enemy. Together, Batman and Wonder Woman work quickly to find and recruit a team of metahumans to stand against this newly awakened threat. But despite the formation of this unprecedented league of heroes, Batman, Wonder Woman, Aquaman, Cyborg and The Flash, it may already be too late to save the planet from an assault of catastrophic proportions. While we wait for more on Justice League, take a look at Zack Snyder's new behind-the-scenes photo below, which comes side-by-side with the shot from the recently-released Justice League video.